TUMWATER, Washington: This story actually happened on or about 06 February, 2013, but I'm bringing it to you now. A “Houseless” man who has been residing in the brush near a railroad line in Thurston County, suffered a medical emergency with restricted movement. For him the only choice was to send his trusted canine – Buddy, an Australian Sheppard mix – to seek help. So the man attached a note expressing a need for “help” to Buddy's dog harness and sent him on the way hoping that Buddy would find a caring person who would know what to do. Buddy did just that when a woman walking her dog along side railroad tracks - in the vicinity of the mans position - and Buddy crossed paths. She noticed something different about the wondering dog which was that something was attached. She read this from the paper Buddy was carrying: “Send Help. No Joke. Cannot walk.”. As well as, this: “Medicine not working. Need doctor.”. 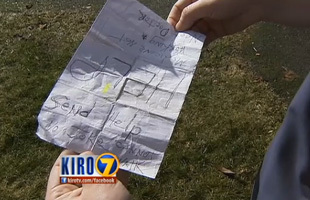 Even though the note was unsigned and no directions were given, something compelled the woman to contact local authorities. Police eventually found the man situated at his camp. According to Detective Jen Kolb, he was completely immobile and very afraid. The man was treated at a hospital, then released. After his release, Buddy and the Houseless man were reunited. For more details concerning the “Houseless” man and Buddy, watch the accompanying video.